Description: BNSF 8185, 8630 on STCPCHI approaching Sullivan. 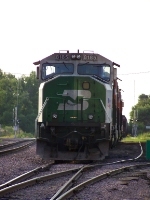 Description: BNSF Eastbound Doublestack Train S- TCPCHI passing through Stoddard, Wi. Description: Renumbered to BNSF 1462. Description: Now that I have a new camera, Im able to zoom in much further and the image is much clearer. Description: Lookimg north from 44th Ave. Taconite ore empties wait on departure track. Plasser PTS-90 track machine on flatcar below bridge. Title: BNSF 8185 Control stand. Description: taken with permission. Inside of view of a Bnsf Sd60m. Title: BNSF 8185 Builder Info. Title: BNSF 8185 Roster Shot. Description: Great looking Unit's in mainline action. Title: BNSF 8185 Another view from in the Cab.